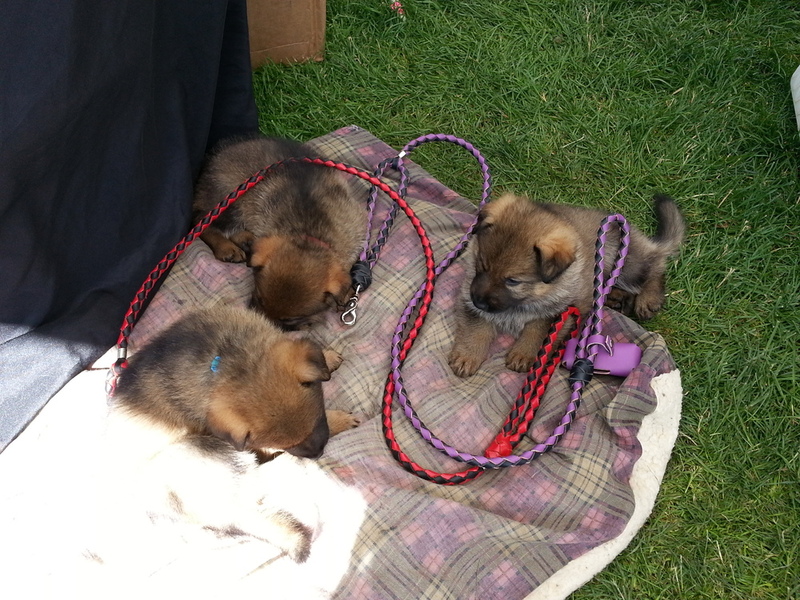 German Shepherd Puppies. Extensively socialized.Early training using observational learning and positive reinforcement. If her magnificent, large, chiseled head and intelligent, piercing gaze are not enough, her intellect and sensitivity are off the scale. Tasha is a diabetic medical alert service dog. To date she has 100% accuracy. She will even wake from a sound sleep to alert her handler. She is what we call a keen dog. She has learned so many commands that her ability to learn a new command comes with only two to three repetitions. She has a strong desire to please her handler but is also able to think for herself in tough situations. She is everything we look for in a German Shepherd. She is very protective of her home and handler, but she is perfectly safe in varied situations and around all people accepted by her handler. Tasha has a very solid nerve base and is clear headed. She can go anywhere with her handler day or night. She has flown several times ( her longest flight was six hours) she is solid in airports and on long plane flights. She is a kind, intuitive dog who takes her job very seriously. She has a medium/high energy level. She needs a hike or a game of fetch in the morning, but burns off the rest of her energy following her handler around town. She is a dog who needs mental stimulation and a job. Click on the picture below to view more pictures of Tasha. Fable is a large female with a masculine look. She has exceptional receptive language ability. Living with her is like living with a child. She understands language so well that we talk to her in sentences and she responds. Her human like character makes her a joy to be around. She has excellent handler focus and is always making eye contact and checking in with her person. She is clear headed and takes commands in all situations without getting lost in distractions. She is a Velcro dog who is always with her handler. She is a problem solver to the extreme and is always top dog in any class or seminar we attend. She is wonderful with children and always keeps a close eye on on them. 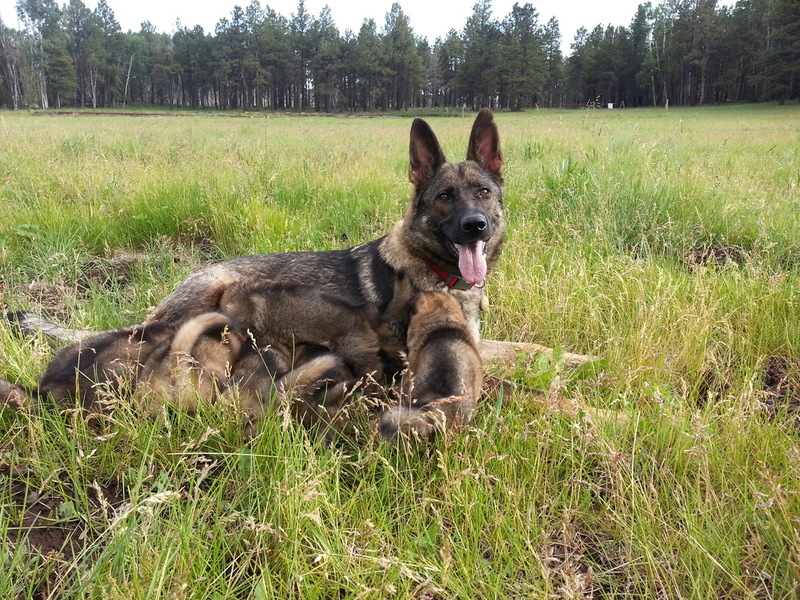 The only time she leaves her handler is when she has children to watch over. Echo is PTSD Service Dog that does alert and deep pressure work. She was retired from service work after a dog attack, on the street, that hospitalized her. Because of her excellent personality and intelligence we were happy to place her in our breeding program. She is a very smart girl who learns quickly, is an excellent problem solver and loves to work. She is a medium energy dog with a high drive to work and train. She can go all day when working but is also happy to hang around the house and rest when there is nothing to do. She is very affectionate, cuddly and loves children.